The ever famous USB Flash Drive started becoming available commercially from the year 2000, and since then they've superseded other formats of data storage such as floppy diskette drives, zip drives and even writable CD's as a standard format. 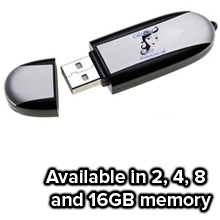 Physically smaller and with superior data capacity (roughly 18,000+ the size of a single floppy drive) USB memory sticks predominantly use the USB mass storage standard and are supported by most common operating systems including Windows, Linux, Mac OS and Unix-based operating systems. We've found these wonderful devices are becoming ever so popular, simply because the format itself is so widely recognised. Even most high schools encourage their pupils to carry a USB flash drive with their homework documents on them. We've the ability to print or engrave your Company's brand-name, logo or perhaps email address or phone number on the surface of the drive, and with custom bespoke shapes to cut to - the possibilities are endless! You can choose from 2, 4, 8, 16 and 32 gigabytes of data storage, more than enough to store documents, music, video, recovery and boot utilities and more. Excellent gift if your are in the IT sector. Order a batch or these flashtastic USB Memory Sticks and you can rest assured you'll see a difference in your profit margins. These are absolutely brilliant business gifts to build brand-awareness with your consumers and also to improve your customer loyalty. Click Here, alternatively click on "Get Prices Now" below to stand out from the crowd! Personalised usb flash drives come with your business details and company logo printed on to ensure that YOU will always be advertised. These handy little data storage devices are great for backing up your files and putting it into your pocket or on your key fob. Our portable printed USB storage device is the perfect solution for data storage, printed up with your company details and logo. Operating without external power and plugging straight into your USB port makes this personalised computer accessory a great promotional gift for any occasion. For more information about our USB Flash Drive Sticks fill in the contact form and we'll get back to you ASAP. This ideal USB flash drive is so handy on a keyring. The beauty of having your business details and company logo printed upon our Personalised USB Flash drive is so when you give them out to your customers as a Christmas promotion or corporate gift, wherever they travel they will always be spelling out your business details and company logo keeping you always one step ahead of your competitors as with the advertising game - it always pays to display!!! Our USB Flash drive with logo comes in many colours, styles and a very varied USB memory range. For a FULL list of all our other promotional items besides our USB Flash Drive Range click here. These little branded memory sticks are a wonderful promotional gift, especially if your a computer company or maybe just internet friendly! 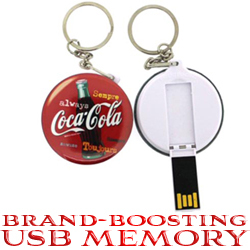 Other promotional and personalised items besides our USB Flash Drives click here. 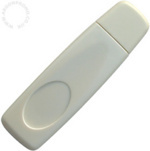 To find out more about our USB Flash Drives click here and fill in the contact form and we'll get straight back to you. View our Advertising USB Men here.